Is there anything better than garlic butter? OK, so I can think of a few things (like chocolate), but when it comes to the savory, garlic butter is about as good as it gets. I am willing to eat just about anything with garlic butter involved. Since I love garlic butter, I thought I’d season my roasted carrots with garlic butter. And let me tell you, they turned out to be soooooo much more amazing than I thought they were going to be. I mean, I thought they’d be good, but these are fantastic. They’re so good that my kids were literally FIGHTING OVER CARROTS. They couldn’t get enough, and neither could I. I promised that the next time I made these that’s I’d double the recipe. There are several reasons why I love this recipe, and yes, the garlic butter is really the main one. But one of the other reasons is how easy this is. I use regular carrots, which requires me to peel and slice them before they’re ready to season and roast. However, if you want even less prep time, just use baby carrots and you don’t have to peel or slice them. I also love how few points this recipe is. The only thing that’s is calculated towards the Points value is the butter. That means that it’s easy to provide a delicious and simple side dish that’s full of nutrition for just a few points. It’s something that doesn’t taste “healthy”, in fact, it tastes sinfully good, so the whole family absolutely loved it. Carrots are something that I always have on hand. I like to keep a bag of them in the crisper to have on hand for recipes and as a quick and easy side dish. They’re full of vitamins and minerals and are a great source of fiber. They’re also chock full of antioxidants, so I love to add them into my meals when I can. So I was thrilled that I could easily whip up these roasted garlic butter carrots as a side for a meal. Carrots are also great to add color to your meal. In fact, you can really dress this up and make it an elegant and fancy side dish for a party. Just use several different colors of carrots – purple, orange, red and even white. Garnish with some fresh parsley and you look like a rock star for something that’s simple and delicious. Since this recipe is so easy to prep, it’s ideal for a weeknight dinner. I like anything that’s ready without much work and without many dishes. It’s tempting to just combine all the ingredients on a sheet pan and roast. However, I’ve really found that cooking the carrots in a skillet in the garlic butter adds to the flavor. It gets the carrots cooking while the oven preheats, but it also allows the garlic flavor to infuse into the butter. Using the skillet to coat the carrots in the butter also ensures a more even coating of the garlic butter on each carrot. That’s a good thing. So, I want to emphasize that you don’t skip this step! I’m loving this incredibly tasty dish that offers another great way to get proper veggie servings onto my family’s plates. This one is one you MUST try and a keeper in our house! TRY THESE OTHER AMAZING VEGETABLE RECIPES! A ridiculous easy side dish recipe that will have your taste buds squealing with delight. 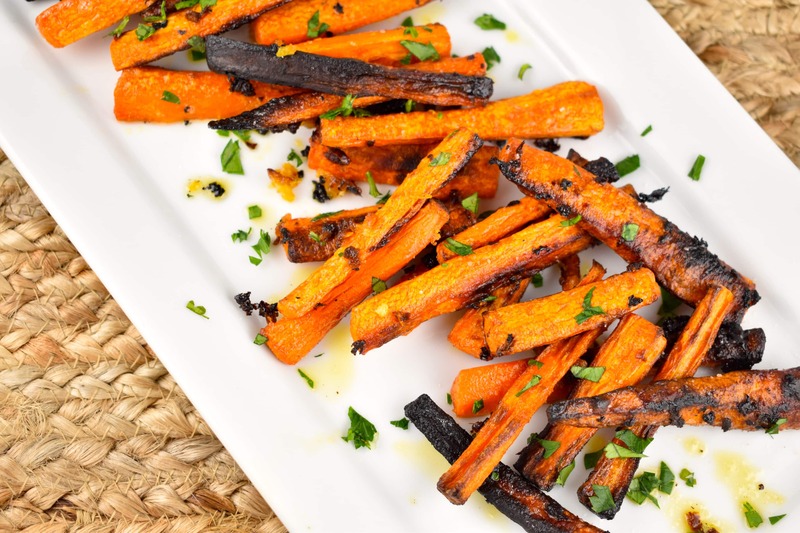 Tender roasted carrots smothered with heavenly garlic butter. Preheat oven to 425 and line a rimmed baking sheet with parchment paper. Melt butter in a sauce pan over medium heat. Add in garlic and a bit of salt. Heat, stirring very frequently for 2-3 minutes. Add carrots to sauce pan, and stir to coat. Heat, stirring frequently for another 2-3 minutes. Transfer carrots to baking sheet, sprinkle with a bit of additional salt, and roast in oven for about 25-30 minutes. Garnish with parsley before serving. Why is there not an option to pin these recipes to Pinterest? Do you have a print button that I’m just missing somewhere? I never get a really “nice-looking” printout of your recipes and I’m probably just overlooking something. how do I pin to pinterest.